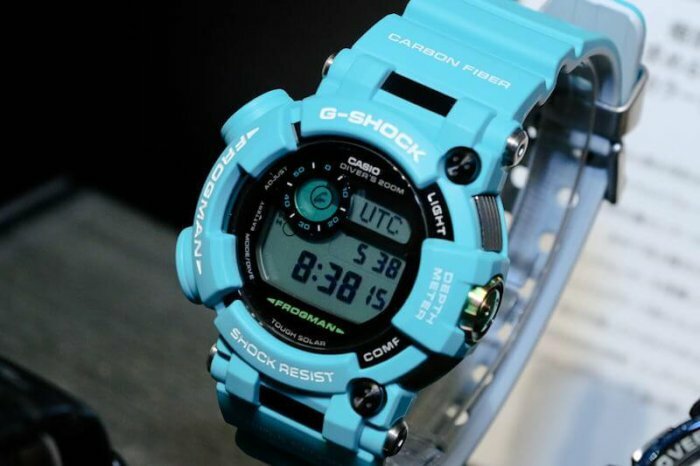 The G-Shock Master in Marine Blue collection is an ocean-themed Master of G series featuring the latest Frogman and Gulfmaster models. 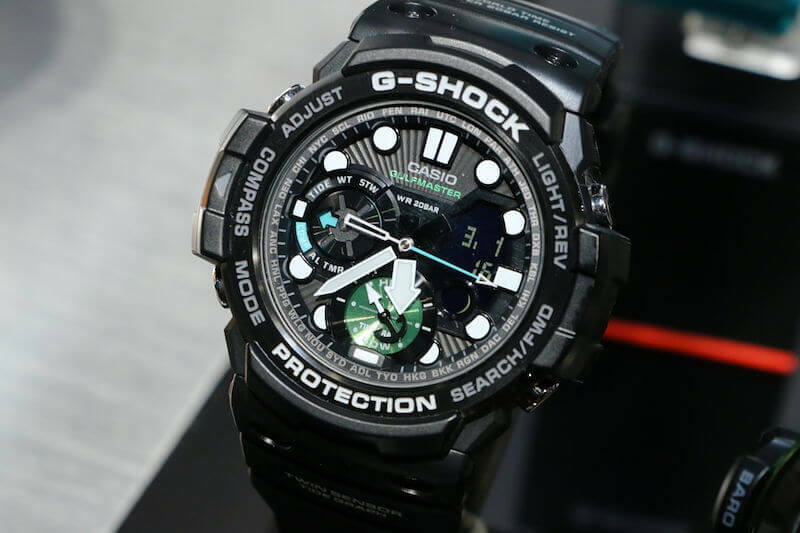 It is scheduled for an April 2017 release in Japan and includes the Frogman GWF-D1000MB-3JF, Gulfmaster GWN-Q1000MB-1AJF, and Gulfmaster GN-1000MB-1AJF. Update: Casio released the GWF-D1000MB-3, GWN-Q1000MB-1A, and GN-1000MB-1A in Asia for April 2017. Update 2: ShopCasio has the GWFD1000MB-3 listed as “Coming Soon: May 2017” with a list price of $1,000 USD. 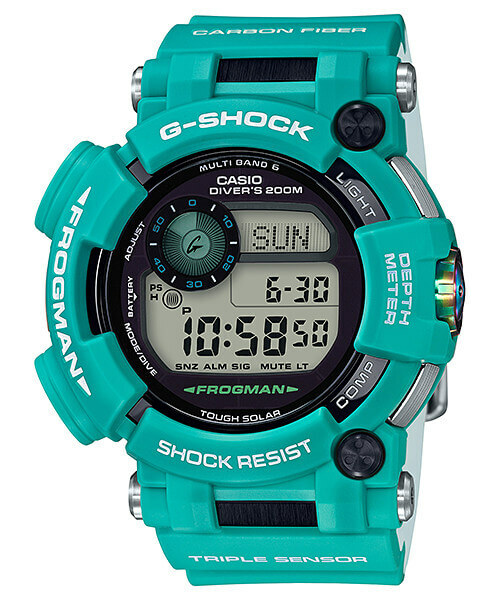 The G-Shock Frogman GWF-D1000MB-3 has a light emerald blue bezel and bands with white lettering. The dual-layer carbon fiber insert band has a white gray inner layer. 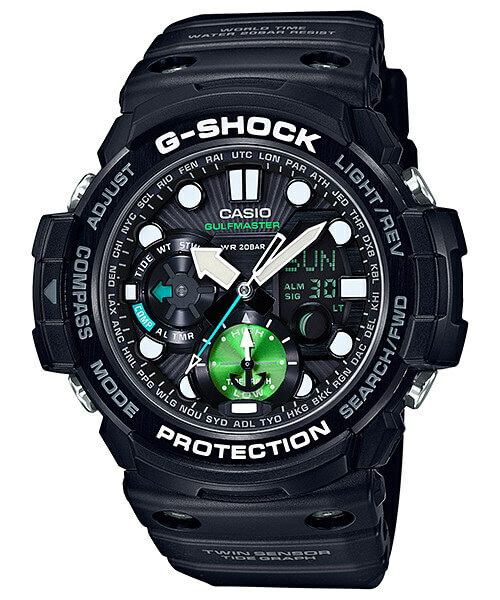 The GWF-D1000 features Tough Solar/Multi-Band 6 and a Triple Sensor with a water depth meter, compass, and thermometer. It also has tide and moon data, 20-record data log, 20-record time stamp function, and a sapphire display. List price for the GWF-D1000MB-3JF is ¥127,000 JPY. 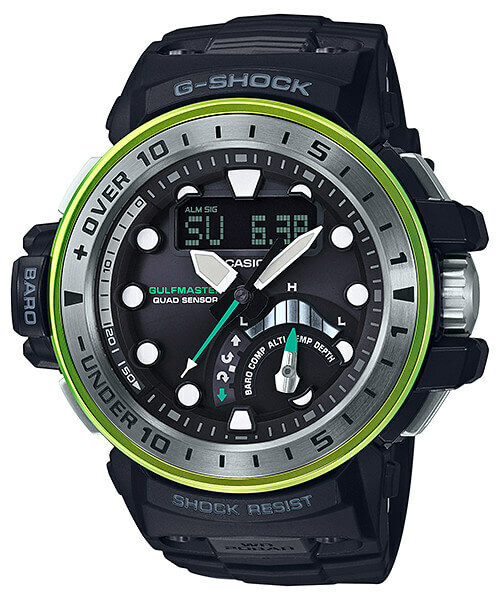 The G-Shock Gulfmaster GWN-Q1000MB-1A has an emerald blue second hand and retrograde needle along with a yellow/green IP applied to the outer bezel. The GWN-Q1000 features Tough Solar/Multi-Band 6 and a Quad Sensor with a water depth meter, altimeter/barometer, compass, and thermometer. Other features include tide graph and moon data, sunrise/sunset data, and a sapphire display. List price for the GWN-Q1000MB-1AJF is ¥100,000 JPY. 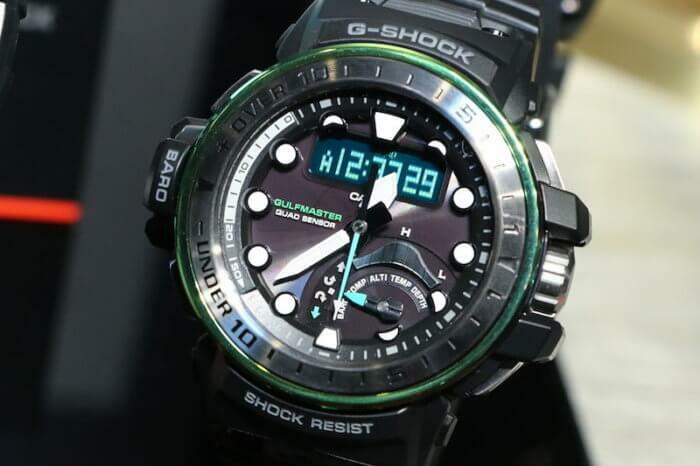 The G-Shock Gulfmaster GN-1000MB-1A has an emerald blue second hand and subdial needle and an emerald green 6 o’clock subdial. The GN-1000 is a Twin Sensor model with a compass and thermometer. List price for the GN-1000MB-1AJF is ¥32,000 JPY.